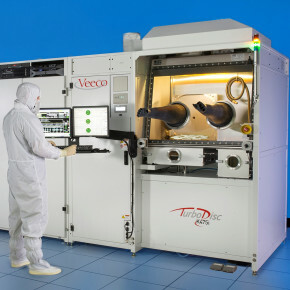 Veeco’s new TurboDisc K475i As/P MOCVD System is the industry’s best reactor for the production of red, orange, yellow (R/O/Y) LEDs, as well as multi-junction III-V solar cells, laser diodes and transistors. The K475i system features a new reactor design incorporating Veeco’s Uniform FlowFlange™ technology producing films with very high uniformity and improved within-wafer and wafer-to-wafer repeatability with the industry’s lowest particle generation. The simple design of the Uniform FlowFlange technology provides ease-of-tuning for fast process optimization and fast tool recovery time after maintenance for the highest productivity for applications such as lighting, solar, laser diodes, pseudomorphic high electron mobility transistors (pHEMTs) and heterojunction bipolar transistors (HBTs).